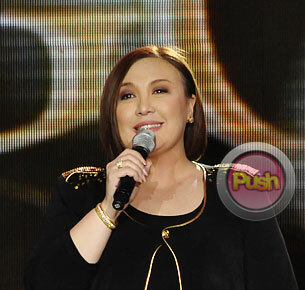 'The Biggest Loser: Pinoy Edition' host Sharon Cuneta says she is open to doing a teleserye now. As her show The Biggest Loser: Pinoy Edition gets ready for its grand finale this coming September 30, host Sharon Cuneta is also getting ready to start shooting for her role as a call center agent in a yet-untitled Star Cinema movie which starts shooting next month, as well as other upcoming projects like proposed reunion movies with Richard Gomez and Judy Ann Santos. With regards to aborted film project with Vilma Santos which will be pushed back to a later date, Sharon said she is still looking forward to sharing the big screen with the Star for All Seasons. After being paired together in the 2000 film Minsan Minahal Kita, Sharon says she is open to doing another film with Richard Gomez although there are no concrete plans about it yet. “Siguro matutuloy pero siguro it’s not with Star Cinema. Baka somewhere else. Hindi ko pa sure yung iba eh. Mag-mi-meet pa kami nila Boss Vic (Del Rosario) at ni Mother Lily (Monteverde),” she shared with Push.com.ph. Fans of her 2002 flick Magkapatid with Judy Ann will also have to wait a little longer as the Megastar admitted she has not been formally offered to do that project just yet. “Wala pang kumakausap sa akin tungkol sa movie project na yan although isa yan sa mga ibi-bring up ni boss Vic sa meeting namin soon,” she said. Sharon shared that she is also looking into getting into producing movies not just for herself but for other stars as well in the near future. “I’m going to go into co-production with certain projects. At saka I’m hoping na kahit hindi ako yung artista, sa iba makiki-co-prod ako possibly with Star Cinema and Viva. So dadahan-dahanin para naman maiba. Matagal ng plano yun. It’s just parang my time is really eaten up by all the projects I do as someone who works in front of the camera. And this is my bread and butter so it’s not a priority to co-produce. But it would be something nice ‘di ba? To be able to do it on the side,” she said. With a fully-booked showbiz schedule, Sharon also dispelled any rumors that hint on her entering politics in the near future. “I thank God I have no plans to enter politics. Kumplikado na enough as it is ang pulitika sa bansa natin na ang ginagawa ko imbis na isipin na sana maayos na yung bansa natin more than anything,” she said.